Full name CARLOS LUIS CARRASCO...Married, Karelis...Two daughters, Camila Valentina (3/4/11) and Emma Victoria (3/29/15), three sons, Noah, Lucas and Elias …Attended Liceo Federico Carmona High School...Was the club's 2015, 2016, 2017-2018 Roberto Clemente Award nominee, spending hours donating time to Esperanza, visiting and donating books to Luis Munoz Marin School in Cleveland, Oberlin College and Indians Baseball Camps...Also collected thousands of books through the United Way Stuff The Bus initiative, as well as collecting food items for the Step Up To The Plate Campaign...Started the Carlos Carrasco Foundation in 2016 with the mission of giving young children a strong foundation for life-long success (has collected over 12,500 books for children)...Foundation is very active in Tampa, Cleveland and his native Venezuela (carloscarrascofoundation.org)...Regular TribeFest participant...On Aug. 4, 2016 the Venezuelan-born Carrasco announced, via Twitter, that he passed his United States citizenship test. Enjoyed another outstanding season in the Indians rotation, ending the season as arguably the best starting pitcher on the ballclub… Topped the 200-strikeout plateau for the third time in the last four seasons, striking out a career-best and team-high 231 batters (fourth-highest total in the A.L. )…He is just the fifth player in Indians franchise history to reach the milestone in three-or-more seasons (with McDowell, Feller, Kluber and G. Perry)...Had a tremendous second half, going 6-5 with a 2.52 ERA in 14 games/13 starts (89.1IP, 76H, 25ER, 20BB, 119SO, .225 avg)...Among A.L pitchers, posted the fourth-lowest ERA after the break and ranked first in innings and strikeouts, fourth in SO per 9.0IP (12.0) and fifth in on-base pct. allowed (.269)…Was second in MLB in second-half strikeouts and innings pitched behind Jacob deGrom (120, 93.2IP)...Season nearly took a disastrous turn on June 16 vs. Minnesota after being struck in the right elbow on a line drive off the bat of Joe Mauer to start the second inning…X-rays and bone scans only reported a contused elbow…Was on the 10-day D.L., June 17-July 5, and made a rehab start on June 30 at AA Akron…Following his July 5 return, Carlos posted a 9-5 mark with a 2.59 ERA (29ER/100.2IP) in 15 starts (17 appearances)…Season was off to a pedestrian start, posting a 4.50 ERA thru his first 12 starts as of June 1 (38ER/76.0IP)...Tossed his ninth career complete game on April 11 vs. Detroit, a 9.0 inning, three-hitter…Tossed his second CG on May 9 at Milwaukee (9.0IP, 5H, 2R/ER, season-high 14 SO)…Also struck out a season high 14 batters on September 7 at Toronto, which both represented single-game bests for any Indians starting pitcher in 2018...His penultimate appearance of the season came in relief on Sept. 25 at Chicago-AL, fanning a club season-best and career relief-high 8 strikeouts (3ER, 4.1IP), the most relief SO by an Indian since Kaz Tadano (9, 6/26/2004 vs. Colorado)…In his final start on Sept. 30, he recorded his 17th win in the 2-1, season-finale at Kansas City(1ER/5.0IP)...Also notched a win in 2018 relief debut on July 15 vs. NYY...Earned his 10th win of the season on July 11 vs. Cincinnati, struck out seven batters and recorded his 1,000th career punchout (12th pitcher with 1,000 strikeouts in an Indians uniform)…Also topped the 1000.0 inning plateau during the campaign and now ranks ninth in club history in career strikeouts (1127) and owns the second-highest SO per 9.0 inning ratio in club history (min. 1000 IP) at 9.27, trailing only Corey Kluber's 9.81…After recording seven double-digit strikeout games in 2018, now has 22 in his Indians career (sixth-most in club history)...Went 7-5 with a 2.46 ERA in 16 games/15 starts vs. the A.L. Central (25ER/91.1IP)…Carrasco owns a 2.66 ERA on the road since the start of 2015, marking the third-lowest ERA in MLB over that span behind Clayton Kershaw (2.47) and Max Scherzer (2.49)…Allowed 18 steals, tied for eighth-most allowed in the league...Signed a two-year extension thru 2022 on Dec. 6. Had an outstanding season, collecting career-bests in wins, starts, innings pitched and strikeouts, finishing in the top 10 in the American League in wins, innings and strikeouts, becoming the seventh pitcher in club history to record at least 18 wins with at least 225 strikeouts and a sub-3.30 ERA...Notched his 200th inning in his final start of the year, an 8.1-inning, 14-strikeout performance on Sept. 28 vs. Minnesota, the 2nd-highest strikeout total of his career and a single-game season-high for the campaign...His 2017 effort earned him a fourth place finish in the A.L. Cy Young voting. Along with Corey Kluber, became the first set of teammates since the 2001-02 Arizona Diamondbacks (Randy Johnson/Curt Schilling) to accumulate at least 18 wins and 220 strikeouts within the same season...The duo also joined the 1973 Angels (Nolan Ryan/Bill Singer), 1971-72 Tigers (Mickey Lolich/Joe Coleman), the 1965 Phillies (Jim Bunning/Chris Short) and 1963-64 Dodgers (Don Drysdale/Sandy Koufax). Went 5-0 with a 1.48 ERA in 6 September starts (42.2IP, 36H, 7ER, 6BB, 51SO), the first Indians pitcher with at least five wins, 50 strikeouts and an ERA below 1.50 in a calendar month since Sam McDowell in June 1969 (6-0, 50 strikeouts, 1.05 ERA,Elias)....Kluber went on to better that mark (0.84 ERA, 5 wins, 50 strikeouts)....Won a career-best 6 straight decisions to finish out the season from August 27-on, going 6-0 with a 1.27 ERA over his last 7 starts (49.2IP, 42H, 7ER, 6BB, 59SO). Was the club's most consistent starter of the first two months of the season as Kluber battled thru back issues, going 5-2 with a 2.89 ERA over his first 10 starts of the season thru May 29 (65.1IP, 44H, 21ER, 16BB, 65SO, .194 AVG)... Earned the lowest April ERA (2.04, 8ER/35.1IP; min. 30.0IP) for an Indians starter since Cliff Lee sported a 0.96 April ERA in his 2008 Cy Young campaign. Went 11-3 with a 2.65 ERA (31ER/105.1IP) in 17 road starts, the most road wins by an Indians pitcher since Cliff Lee went 12-3 in his 2008 Cy Young campaign...Went 12-2 with a 1.94 ERA (23ER/106.2IP) in 16 starts against the A.L. Central opposition... Second-lowest intradivisional ERA in Major League Baseball this season (min. 60.0IP) behind only Clayton Kershaw (1.90 ERA vs. N.L.West). Struck out six-or-more batters in 25 of his 32 starts this year, and posted a career-best eight-start streak with at least six punchouts from August 6 - September 11...His 25 such starts were T3rd-most in the American League this season and T4th in MLB....Carrasco reached the 200 strikeout milestone for the second time in his Major League career (also 2015)...Carrasco is just the 8th pitcher in Indians franchise history to record multiple seasons of 200+ strikeouts (McDowell, Feller, Kluber, G. Perry, Colon, Tiant, Score) ...Had five double-digit strikeout performances on the year and now has 15 for his career. Since the beginning of 2015, Carrasco has amassed 10.05 strikeouts-per-9.0IP, the 5th-highest rate among American League pitchers & 9th-best in MLB in that span (minimum 400.0 innings pitched)...Carrasco also sports a 4.74 K/BB ratio since 2015, which ranks 3rd in the A.L. over that span and 6th in MLB...Tossed his first complete game of the season (8th of his career) on September 6 at Chicago-AL, allowing just one run on three hits with no walks and eight strikeouts. 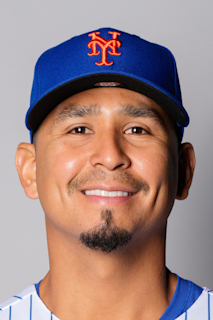 Hit a bit of a rough patch over an 11-start stretch, June 22-August 26, going 4-3 with a 5.29 ERA (63.0IP, 64H, 37ER, 18BB, 78SO) that took his ERA from 2.99-3.95...Major League batters hit .230 (60/261) off him with men on base (15th-lowest mark in the A.L.) and .238 (31/130) with runners in scoring position (7th-lowest in the A.L. )...Batters hit .180 (11/61) with RISP-2outs...ERA in the first inning was 2.25 (8ER, 32.0IP)...Did not allow a home run in any of his last 18 innings. Enjoyed another solid season near the top of the club's rotation, but was limited to 25 starts due to injuries in April and September that ended his season two weeks early and forced him from his first postseason opportunity…At time of his last start on Sept. 17 vs. Detroit (2 pitches), he was 10th in the American League in ERA (3.32), 8th in strikeout/walk ratio (4.41) and on-base pct. allowed (.286) and 13th in batting average against (.240)…Was forced from his final start on Sept. 17 vs. Detroit after Ian Kinsler's line drive to lead off the game broke the fifth metacarpal on his right hand (shortest start of his career and shortest-ever by an Indian in the era of pitch counts-2)...Placed on 60-day D.L. on 9/30...Season got off to a nice start, going 2-0 with a 2.45 ERA in four April starts (22.0IP, 16H, 6R/ER, 5BB, 20K, .200avg) before sustaining a strained left hamstring covering first base in Detroit on April 24…Was placed on the 15-day disabled list the following day for the fifth time in his career and made one rehab start in Akron on May 28 before being activated 38 days later prior to his start vs. KC on June 2…Went 2-2 with a 2.61 ERA in June starts after returning (41.1IP, 36H, 12ER, 10BB, 43SO)...Tossed his seventh career complete game & third career complete game shut-out on June 25 at Detroit (9.0IP, 4H, 0R, 1BB, 7SO, 117P)…Recorded five-or-more strikeouts in 21 straight games from 6/13/15-4/19/16, the second-longest active streak in the majors at the time and the second-longest such streak in Indians history behind Bob Feller's record of 28 consecutive games (September 9, 1945-July 20, 1946)…Fanned a season-high 14 batters (2nd-highest game total of his career) on June 30 at Toronto, one shy of his career-high 15 punchouts on Sept. 25, 2015, at Kansas City… Marked just the third time since 1913 an Indians pitcher fanned 14 in less than 8.0IP or work (7.1IP, 3H, 1R/ER, 2BB), joining Corey Kluber (2014) and Sam McDowell (1966)...Earned the win on July 20 at Kansas City, holding the Royals scoreless on one hit and two walks with six strikeouts over 6.0 innings, marking the fourth time Carrasco has allowed one or fewer hits in an outing of 6.0 innings or more…Struck out 11 on Aug. 17 vs. Chicago-AL, his second-highest SO total of the season …marked his first career game with 10-or-more strikeouts and no walks, which he nearly matched on Sept. 2 vs. Miami (1BB, 11SO, 10th-career double digit strikeout game)… Earned his ninth win of the season on Aug. 22, shutting out Oakland on four hits over 8.0 innings with nine strikeouts and no walks…Despite that outing went 2-3 with a 5.20 ERA in 6 August starts (36.1IP, 42H, 21ER, 5BB, 46SO)…Was inflated by a 3.2IP, 8 R/ER (career-highs) outing vs. Minnesota on August 2...From August 7 to September 2, Carrasco struck out eight-or-more in six consecutive starts, tied with Clayton Kershaw for the longest streak in MLB this season…Batters hit .215 (42-195) with runners on base (9th-lowest in the A.L.) and .200 (20-100) with RISP… Walked only 2.1 batters per 9.0IP which was 11th-best in the A.L. at the time of his injury…Walked only 4 of 108 batters (3.7%) with runners in scoring position. (MLB Rank: 6th)…Did not allow a walk in his last 137 PA's against a RHH dating back to July 27 (longest active streak in MLB). Spent his first full season in the Indians rotation, and once again finished with a strong second-half performance, going 4-5 with a 2.99 ERA down the stretch (75.1IP, 48H, 26R/25ER, 8HR, 20BB, 94SO, .181 AVG)...Had a slow start out of the gates, going 4-4 with a 4.98 ERA (24ER/43.1IP) through his first 8 starts of the year...Finished the first half of the season 10-7 with a 4.07 ERA (49ER/108.1IP) and managed to finish the year with a 3.63 ERA...From July 30 thru the end of the year, Carrasco went 4-4 with a 2.48 ERA (18ER/65.1IP) and a .163 average against (37-for-227)...Since the start of 2014, the Venezuela native ranks among MLB pitchers in second half stats in the following categories: average against (5th, .190), OBP (5th, .239), ERA (8th, 2.34) strikeouts (11th, 180) and strikeouts-per 9.0IP ratio (8th, 10.52)...Finished the season with 216 strikeouts (T9th in MLB, T5th in A.L. ), surpassing 200 strikeouts in a single season for the first time in his career...Joined Corey Kluber (245 K's) to become the first Indians teammates to reach the 200-K mark in a single season since Sam McDowell and Luis Tiant pulled the trick in 1967 and 1968...Finished the season recording 5+ K's in 18 straight contests, the longest such streak by an Indians pitcher in a single season since Bob Feller did so in 23 straight contest in 1946...Feller's streak was part of a longer 28 game streak from Sept. 9, 1945-July 20, 1946...Was placed on the 15-day disabled list from Aug. 26-Sept. 8 (retroactive to Aug. 22) with right shoulder inflammation...Marked his first stint on the disabled list since 2012 when he was rehabbing from 2011 right elbow surgery...Went 2-3 with a 4.21 ERA (12ER./25.2IP) in his 5 starts after coming off the DL...In his penultimate start of the season, Carrasco earned his team-leading 14th win of the year with a one-hit, complete-game shutout at Kansas City on Sept. 25...Carried a no-hitter into the 7th inning and finished with a career high 15 strikeouts in his 6th career complete game (9.0IP, 1H, 0R, 2BB, 15SO, 113 pitches/78 strikes)...According to Elias, Carrasco became the first pitcher in Cleveland history to toss a one-hit shutout with 15+ K's...Also became just the third pitcher in franchise history to record 15+ K's in a CG shutout, joining Sonny Siebert (15 K's) in 1965 and Luis Tiant (19 K's, 10.0IP) in 1968...Both Siebert and Tiant accomplished the feat at home...Came a strike away of his first career no-hitter on July 1 at Tampa Bay...The right-hander struck out a then career-high 13 batters in the 8-1 victory, losing a perfect game bid in the 7th inning and the no-hitter on an 0-2 pitch to Joey Butler who lined a single into right field with 2 outs in the 9th inning (8.2IP, 1H, 1R/ER, 2BB, 13SO, 124 pitches/83 strikes)...Marked the ninth no-hit bid to get broken up with 2 outs in the 9th inning since 2002 and the third to get erased on a two-strike base hit (Elias)...According to SABR's Stew Thornley, it marked the first Cleveland no-hit bid to get broken up with 2 outs in the 9th since July 4, 1954 (Early Wynn)...Carrasco logged 9.0 innings in consecutive outings from July 30-Aug. 4, working a CG in a July 30 win at Oakland (2H, 1R/ER, 1BB, 7SO), and registering 9.0 scoreless innings in a 12-inning victory at Los Angeles-AL on Aug. 4 (1H, 0R, 1BB, 7SO)...Became the first A.L. starter to toss at least 9.0 innings while allowing 2-or-fewer hits in consecutive starts since Oakland's Bobby Witt on June 23 & 28, 1994 - the first pitcher to pull the trick for Cleveland since Sam McDowell on May 29 & June 2, 1970...His July 30 outing was his second complete game of the season and was the third of three consecutive complete games tossed by Indians starters, as Trevor Bauer and Corey Kluber did so against Kansas City on July 28 and 29...Marked the first time Cleveland has tossed 3 straight CG's since 1994 when Mark Clark, Jack Morris and Charles Nagy accomplished the feat on June 30 vs. Baltimore and July 1 & 2 vs. Minnesota...The 28-year-old worked 26.0 combined innings in three starts from July 30-Aug. 11, yielding just 3 runs (earned) on 7 consecutive hits (3R/ER, 2HR, 2BB, 22SO)...Tossed 8.0+ innings in each of those games, becoming the fifth Indians pitcher and first since Cliff Lee in 2008 to log 8.0-or-more innings while allowing 4-or-fewer hits in three consecutive starts...During that stretch, Carrasco had a 22.0 scoreless inning streak, which was snapped on Aug. 11 against New York-AL when Stephen Drew connected for a solo home run in the top of the 6th inning...Was the longest scoreless streak by any Indians pitcher this season, and the longest for an Indians hurler since Roberto Hernandez also tossed 22.0 scoreless innings from Sept. 3-16, 2010. Split the season between the rotation and bullpen and was the most dominant pitcher in the American League over the last two months of the season (see box at right)...Was in the starting rotation out of spring training, April 5-25 (0-3, 6.95 E RA, 17E R/ 22.0IP ), and ended the season there with 10 dominant starts from August 10-Sept. 27, going 5-3 with a 1.30 ERA to end the season (69.0IP , 45H, 10E R, 1BB, 78K ) to form a powerful 1-2 p unch alongside Corey Kluber...His 1.30 ERA from Aug 10-end of season was the lowest in MLB over that span (min 9GS)...Became the first Indians pitcher since 1991 (Rod Nichols) to post a save and a shutout within the same season. Following April rotation stint he went 3-1 with a save out of the bullpen, posting an ERA of 2.30 (43.0IP , 34H, 11E R, 9BB, 39K , .217 AVG ) from April 30-August 5...Worked 12.2 scoreless innings in relief from June 22-July 25 and earned his first professional save on June 16 vs. the LA Angels, preserving a 4-3 win by recording the final 7 outs of the game (2.1IP , 1H, 0R, 1BB, 4K )...Worked 4.0 IP of relief two times to set 2014 club highs for single-game relief, the last coming on August 5 vs. Cincinnati that prepped his return to the rotation..O ver his last 16 relief outings (June 10-Aug. 5) his ERA was 1.23 (26.0IP , 21H, 6E R) as batters hit .180 (11/ 61) w/ men on (18th in A.L at time in relief) and .161 (5/ 31) with RISP (19th-lowest relief mark in league). Made his fifth start of the year, his first since April 25, on August 10 at New York-AL (5.1IP, 2H, 0R, 0BB, 4., 77 P), marking his first win as a starter since June 29, 2011 at Arizona and snapping a 12-game losing streak as a starter covering 17 starts...Was 4-0 with a 0.70 ERA over his first 6 starts from August 10-Sept. 7 (38.2IP, 25H, 3R.ER, 4BB, 42., .179 A9G) to lower his season ERA from 3.88-2.69...Recorded scoreless starts on August 10 and August 16 vs. Baltimore (7.0IP ) and did not allow a run over 16.0 straight IP from August 10-22...Dating back to 1900, Carrasco became just the 3rd p itcher in Major League Baseball to post back-to-back shutout victories immediately following a streak of 15 or more starts without a win, joining Ryan Dempster and Bud Norris (both in 2012), and both after streaks of 18 winless starts (Elias). Carrasco recorded his first career complete-game shutout (3rd career CG, first w.9.0 IP) in his start of September 17 at Houston, holding the Astros to a pair of infield singles and one walk, while registering a single-game career-high 12 strikeouts on 98 pitches...Joined Sandy Koufax as just the second pitcher ever to record a shutout on 98-or-fewer pitches while also tallying 12+ Ks, who did it (9.0 IP , 1 BB, 12 SO , 97 p itches) in a 3-0 no-hitter on June 4, 1964 at Philadelphia... Marked just the third time in Cleveland franchise history for an Indians hurler to allow 2-or-fewer hits and record 12+ strikeouts in a road shutout, as Carrasco joined Bob Feller (July 12, 1940 at Philadelphia-AL) and Bartolo Colon (Sep t. 18, 2000 at New York-AL)...Paired with Kluber's (2BB/ 14K ) effort the previous night, Carrasco's outing cemented just the 4th instance in MLB history for an A.L. team to get consecutive starts of at least 12 Ks and 2-or-fewer walks - the 2nd in Cleveland franchise history (Elias). Over his last 3 starts beginning with the Sept. 17 shutout he was 1-2 w/ a 1.13 ERA (24.0IP , 13H, 3E R, 31K ) and in 6 September starts he was 2-3 w/ a 1.62 ERA (44.1 IP , 34 H, 8 ER, 8 BB, 54 K )...Indians were shutout, 2-0, over each of his last 2 starts and scored 8 runs in the 6 Sept. starts...MLB hitters had a slash line of .256/ .287/ .543 off him, as lefties hit .196 (45-230, 14th-lowest mark in A.L.) w/ a .516 O P S (.221 mark vs. RHH was 8th-lowest in A.L. )...Overall on the year batters hit .213 (39-183, 10th-lowest in A.L.) with runners on base and .221 (23-104) with RISP. Spent the entire season rehabbing from right elbow reconstruction in September of 2012, mainly rehabbing at the Player Development Complex in Goodyear, AZ...Did throw a simulated game in Akron on September 3 and started the first game of the Double-A playoffs for Akron on September 5...Went on to make 3 starts in the Eastern League playoffs (4.0IP, 3H, 3R/ER, 4K)...Also started games in the Arizona Parallel League starting at the end of September. Showed signs of being a consistent Major League starter before an elbow injury ended his season in early August...Was on the DL from April 25-May 10 with right elbow inflammation, making a rehab start at AA Akron on May 6 (3.2IP, 4H, 4R)...Won three straight starts from May 17-28 going 3-0 w/a 4.15 ERA over the span (17.1IP, 18H, 8ER)... Tossed a career-high 8.1 shutout innings on June 7 vs. the Minnesota Twins, a 1-0 Indians win in Progressive Field...Career-high 8.1IP, 3H, 0R, BB, 6K...Went 7.0IP shutout IP on June 13 at NYY (7.0IP, 5H, 0R, 3BB, 7K)...Earned his 8th win June 29 at Arizona (7.0IP, 4H, 2ER)... Did not allow a run over 21.1IP from June 7-18, season-long by an Indians pitcher this year and career-high... Went 4-2 w/a 1.90 ERA (42.2IP, 30H, 9ER, 7BB, 28K) in 6 starts in June...Tossed first career complete game on June 24 at SF (8.0IP, 6H, 4R/1ER) in a losing effort...Won 6 of 7 starts from May 17-June 18 and from May 17 to June 29 was 7-2 w/a 2.55 ERA over 9 starts (60.0IP, 48H, 17ER)...Lost all 5 starts in July (9.13 ERA, 23.2IP, 35H, 24ER, .340avg) to raise his ERA from 3.54 to 4.67... Was winless over his last 6 starts of the season from July 5-August 3 (30.2IP, 44H, 27ER, 7.92ERA)...Ejected from start on July 29 vs. KC after throwing pitch at the head area of Kansas City's Billy Butler (3.1IP, 7H, 7R/ER, 3HR) after yielding a grand slam to Melky Cabrera...Suspended by MLB for 6 games on August 1, a suspension he must still serve...Placed on the 15-day DL for the second time in 2011 on August 4 after final start at Boston on August 3 (7.0IP, 9H, 3R)...Missed the remainder of the season and underwent reconstructive right elbow surgery in New York City (Dr. David Altchek) on September 21 and will miss all if not most of the 2012 season....vs.RH:.216(49-227)5HR...Was 3-7 w/a 6.87 ERA in 10 home starts and 5-2 w/a 2.84 ERA in 11 road starts. Had a very productive year between AAA Columbus and Cleveland, making 7 Major League starts in September/October, going at least 6.0IP in all 7 starts with 6 quality starts in a row in September...Started the season at Columbus and went 2-2 with a 3.86ERA in his first 8 starts (46.7IP, 45H, 20ER, 20BB, 34K)...In his following seven starts fromMay 28-June 30 he went 6-1 with a 4.60ERA (45.0IP, 47H, 23ER, 14K, 45K) and improved to 8-3 on the year...Picked up his third straight win on June 9 vs. Rochester by hurling a season-high 8.0 shutout innings and a seasonhigh9 strikeouts...8.0IP, 3H, BB, 9K...On August 17 vs. Scranton/WB, Carrasco became the first 10-game winner forColumbus since Pete Munro in 2005...Was removed from the game on July 20th at Durham after 3.1 innings with rightelbow discomfort...2H, 0R, 0BB, 5K...Didn't miss a start making his next one on July 25 vs. Pawtucket...ND, 4.0IP,3H, 2R, 4BB, 3K...Over his last 8 starts at Triple-A, he was 2-2 with a 2.08ERA (47.2IP, 32H, 13R/11ER, 8BB, 44K)....Went 10-6 with a 3.65ERA in 25 starts this year with Columbus (150.1IP, 139H, 69R/61ER, 46BB, 133K, .250avg)...At the time of his September 1st promotion to Cleveland he was 4th in the IL in strikeouts, T5th w/a 1.23WHIP, 6thin innings pitched, T7th in wins and 9th in ERA...Triple-A hitters batted .250 (139-556) off him this year with 16HR...LH hitters batted .233 (60-258) of him while RH hit .265 (79-298)...Batters hit .226 (49-217) with runners on and .270(38-141) w/RISP....Recalled by the Indians on September 1 when rosters expanded and made his 2010 debut that day vs. the ChicagoWhite Sox in Progressive Field, a 6-4 loss to the Sox...Did not receive a decision despite leaving with the Indiansleading 4-1...7.1IP, 6H, 3R/ER, BB, 4K...ND in his 2nd start at the LA Angels (ND, 6.0IP, 6H, 2R/ER, 2BB, 6 strikeouts)...Worked 7.1 scoreless IP in start of Sept. 11 vs. MIN (ND)....Picked up his first Major League win in his last start of Sept 17 in Kansas City, an 11-4 win over the Royals and KyleDavies...6.0IP, 8H, 3R/ER,1BB, 6K....Notched 2nd ML win on Sept 27 vs. DET (6.0IP, 11H, 3R/ER)...Overall in Septemberhe went 2-1 w/a 3.26 ERA in 6GS (38.2IP, 42H, 14ER, 29K)...Was 12th in the AL in ERA among pitchers w/30.0IP, 7thin IP and 11th in SO...Fanned a career-high 9 batters in his final start of the season at Chicago on October 2 in his firstcomplete game of his career in a rain-shortened 6.0IP game (6.0IP, 5H, 6R/5ER, 3BB, 9K)....Worked at least 6.0IP in all 7 GS this year with CLE...0HR to LHH with CLE (.581OPS) and none with runners onbase (all 6 HR allowed solo HR)...Named the 7th best prospect in the Indians organization entering the season byBaseball America....Batters hit .261 (18-69) with runners on and .235 (12-51) with RISP....Allowed 5 SB against 6CS...LHH batted .193 (16-83). Newly acquired RHP spent the regular season at the Triple A level before making the first five (5) starts of his big league career in September...Entered the season as the #2 overall prospect in the Phillies organization according to Baseball America and 52nd overall minor league prospect by BA...Among International League pitchers he finished the season 1st in strikeouts (148), 2nd in innings pitched (157.0), T4th in the IL in wins (11) and T2nd w/26GS...Got off to a fine start at Lehigh Valley, posting an ERA of 2.37 thru his first 3 starts (19.0IP, 14H, 5ER) and fanned a season-high 10 batters on April 21 at Syracuse (7.0IP, 3H, 3R/ER, 1BB, 10K)...Lost 6 straight decisions from April 21-May 24, posting an ERA of 7.25 over the span (36.0IP, 46H, 29ER)and went a season-low 2.2IP (8H, 6R) on April 26 vs. Pawtucket...Lost each of 4 straight starts from May 7-May 24 as he went a combined 0-4 w/a 6.23 ERA (26.0IP, 30H, 18ER)...Was 0-4 w/a 5.94 ERA (33.1IP, 41H, 26R/22ER, 12BB, 35K) in 6 May starts...Earned his 1st victory of the 2009 season on June 4 at Indianapolis (6.1IP, 3H, 2R/ER, 2BB, 5K) in his 11th start of the season...Won 4 of his 5 starts during the month of June as he went 4-1 w/a 4.06 ERA (31.0IP,30H, 15R/14ER, 10BB, 26K) in 5 starts...Overall won 5 of 6 decisions from June 4-July 2 (3.65ERA, 37.0IP, 36H, 15ER)...On the year with Lehigh Valley was 6-9 w/a 5.18 ERA (114.2IP, 118H, 73R/66ER, 38BB, 112K) in 20 starts prior to the July 29th trade...Switched dugouts and made his 1st start with the Clippers on July 31 at Lehigh Valley as he earned the win in a 9-6 Columbus win... 5.1IP, 8H, 4R/ER, BB, 6K...Struck out 10 batters for the 2nd time this year, tossing aseason-high 8.0 innings on August 11 at Indianapolis as he won his 9th game (8.0IP, 4H, 1R/ER, 0BB, 10K)...Improved to 10-9 in his start of August 16 vs. Indianapolis (7.2IP, 5H, 2R/1ER...Won each of his first 4 starts with the Clippers from July 31 to August 16th as he was 4-0 w/a 3.45 ERA (28.2IP, 22H, 12R/11ER, 5BB,27K)...With Columbus was 5-1 w/a 3.19 ERA (42.1IP, 31H, 18R/15ER, 7BB, 36K, .196 avg) in 6 starts with the Clippers...Tossed at least 5.0 innings in each of his 6 starts with the Clippers...Went at least 6.0 innings in 5of the 6 starts and at least 7.0 innings in 4 of the 6...Combined Triple A batters batted .245 (149-608) off him this year with 17HR...LH hitters hit .229 (57-249, 5HR) and RH hitters batted .256 (92-359, 12HR)...Recalled by the Indians when rosters expanded on September 1...Lost his Major League debut on September 1 vs. the Detroit Tigers in Comerica Park, an 8-5 loss to the Tigers and Edwin Jackson...3.0IP, 9H, 6R/ER,3BB, 3K, 3HR (Inge, Guillen, Polanco)...Did not get a decision in his 2nd start of Sept 8 vs. Texas, an 11-9 win over the Rangers and Neftali Feliz...5.0IP, 8H, 5R/ER, 3BB, 4K, HR to Murphy and Borbon...Lost his last three starts, Sept 13-Oct 1 (14.1IP, 23H, 11ER) and left his last start at Boston with a bruised left quad after beinghit by a Jacobs Ellsbury lined drive in the 4th inning...Picked off 3 runners in his 5 starts. Was a non-roster invitee to spring training...Split the season between Reading (AA) and Lehigh Valley (AAA), going a combined 9-9, 3.69 ERA in 26 games (25 starts)...Had 155 SO in 151.1 IP (9.2 SO/9.0 IP)...Pitched for the World Team at the All-Star Futures Game at Yankee Stadium...Named to the midseason Eastern League All-Star team...Began the season with Reading before beingpromoted to Lehigh Valley on 8/2...Ranked 5th in the EL in strikeouts (109) at the time ofhis promotion...Finished 2nd among all Phillies minor leaguers in SO(155) and 5th in ERA (3.69)...Did not allow a run in 4 home starts for Lehigh Valley(25.2 IP)...Pitched winter ball in Venezuela for Caracas. Combined to go 12-6, 3.86 ERA, 2 SHO in 26 games (25 starts) between Clearwater (A) and AA Reading...Began the season with Clearwater and was selected as a Florida State League midseason All-Star...Promoted to Reading on 6/20...Threw a rain-shortened 6.0-inning no-hitter, 8/21 vs Altoona...Named Phillies Minor League Pitcher of the Week 3 times: 5/28-6/3 (1-1, 1.42 ERA, 6 H, 6 BB, 9 SO), 6/11-17 (1-0, 0.00 ERA, 9.0 IP, 3 H, 7 SO) and 8/20-26 (2-0, 0.69 ERA, 13.0 IP, 6 H, 10 SO, 6 BB)...Pitched for the World Team at the All-Star Futures Game in San Francisco (1.0 IP,H, BB, 2 SO)...Rated as the top prospect in Phillies minor league system by Baseball America following the season. Won the Paul Owens Award as the best pitcher in the Phillies minor league system...Spent the season with Lakewood (A) and tied for the South Atlantic League lead in CG (2), finished 3rd in the SAL in both ERA (2.26) and SO (159)...Won Phillies Minor League Pitcher of the Month for May (3-1, 2.18 ERA) and August (5-1, 1.82 ERA)...Reacheddouble digits in SO in 3 games, including a pro-high 11 SO, 8/8 at Asheville (7.1 IP, 2 H, 2 ER)...Took a perfect gameinto the 8th inning, 8/8 at Asheville (L, 7.1 IP, 2 ER); in his next start, he teamed up with Andrew Barb to combine forthe 3rd no-hitter in BlueClaws history, 8/13 vs Lexington...Selected as both a midseason and postseason SAL All-Starand pitched for the World Team at the Futures Game in Pittsburgh during the MLB All-Star break (0.1 IP, 2 H)...Namedthe top prospect in Phillies minor league system by Baseball America following the season. Made starts at 3 levels: Lakewood, Batavia (A) and the Gulf Coast Phillies (R). July 6, 2018 Cleveland Indians activated RHP Carlos Carrasco from the 10-day injured list. June 30, 2018 Cleveland Indians sent RHP Carlos Carrasco on a rehab assignment to Akron RubberDucks. June 17, 2018 Cleveland Indians placed RHP Carlos Carrasco on the 10-day disabled list. Right elbow contusion. November 7, 2016 Cleveland Indians activated RHP Carlos Carrasco from the 60-day disabled list. September 30, 2016 Cleveland Indians placed RHP Carlos Carrasco on the 60-day disabled list. Broken right hand. June 2, 2016 Cleveland Indians activated RHP Carlos Carrasco from the 15-day disabled list. May 28, 2016 Cleveland Indians sent RHP Carlos Carrasco on a rehab assignment to Akron RubberDucks. April 25, 2016 Cleveland Indians placed RHP Carlos Carrasco on the 15-day disabled list. Strained left hamstring. September 8, 2015 Cleveland Indians activated RHP Carlos Carrasco from the 15-day disabled list. October 4, 2013 Cleveland Indians activated RHP Carlos Carrasco. October 2, 2013 Cleveland Indians reassigned RHP Carlos Carrasco to the minor leagues. September 3, 2013 Cleveland Indians recalled RHP Carlos Carrasco from Columbus Clippers. August 31, 2013 Cleveland Indians optioned Carlos Carrasco to Columbus Clippers. August 9, 2013 Cleveland Indians recalled Carlos Carrasco from Columbus Clippers. July 9, 2013 Cleveland Indians optioned Carlos Carrasco to Columbus Clippers. July 7, 2013 Cleveland Indians designated Carlos Carrasco for assignment. July 6, 2013 Cleveland Indians recalled RHP Carlos Carrasco from Columbus Clippers. June 29, 2013 Cleveland Indians optioned Carlos Carrasco to Columbus Clippers. June 28, 2013 Cleveland Indians recalled Carlos Carrasco from Columbus Clippers. June 24, 2013 Cleveland Indians optioned Carlos Carrasco to Columbus Clippers. June 17, 2013 Carlos Carrasco roster status changed by Cleveland Indians. June 11, 2013 Carlos Carrasco roster status changed by Cleveland Indians. June 9, 2013 RHP Carlos Carrasco roster status changed by Cleveland Indians. June 8, 2013 Cleveland Indians recalled RHP Carlos Carrasco from Columbus Clippers. April 12, 2013 Carlos Carrasco roster status changed by Columbus Clippers. April 10, 2013 Cleveland Indians optioned RHP Carlos Carrasco to Columbus Clippers. November 2, 2012 Carlos Carrasco roster status changed by Cleveland Indians. September 26, 2012 Leones del Caracas activated RHP Carlos Carrasco. September 5, 2012 sent RHP Carlos Carrasco on a rehab assignment to Akron Aeros. November 2, 2011 Cleveland Indians activated RHP Carlos Carrasco from the 60-day disabled list. September 6, 2011 Cleveland Indians transferred RHP Carlos Carrasco from the 15-day disabled list to the 60-day disabled list. August 4, 2011 RHP Carlos Carrasco suspended. May 11, 2011 Cleveland Indians activated RHP Carlos Carrasco from the 15-day disabled list. May 6, 2011 sent RHP Carlos Carrasco on a rehab assignment to Akron Aeros. September 1, 2010 Cleveland Indians recalled Carlos Carrasco from Columbus Clippers. April 1, 2010 Cleveland Indians optioned Carlos Carrasco to Columbus Clippers. October 7, 2009 RHP Carlos Carrasco assigned to Leones del Caracas. September 1, 2009 Cleveland Indians recalled Carlos Carrasco from Columbus Clippers. July 30, 2009 Lehigh Valley IronPigs traded RHP Carlos Carrasco to Columbus Clippers. July 30, 2009 RHP Carlos Carrasco assigned to Cleveland Indians.